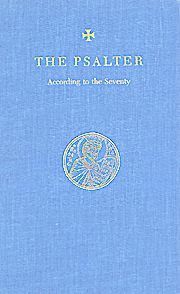 These are the hymns from the Holy Scriptures that King David sang to the Lord and are presented divided into how these psalms are read in the Orthodox liturgical during the services of Orthros (or Matins) and Vespers. Many Orthodox cultures taught their children to first read from this book. Almost every Orthodox Saint that has left us written instruction or words for edification draws upon these hymns often in their teachings. Jesus Himself quoted them when He walked on Earth. Hardbound. 312 pp.